Below is a listing of our top 10 tips for writing an effective e-mail. Following these suggestions will get you a better response from your e-mails and make e-mailing more enjoyable for you and your recipients. Less is more. The shorter you can keep your e-mail while still relaying your message or question the better. At most we suggest no more than three paragraphs of text. 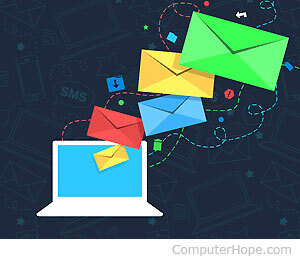 The subject of the e-mail should contain enough information to let the recipient know the contents of an e-mail. E-mail with spelling and other grammatical errors tells the reader it's not that important. Always spell check, keep the below suggestions in mind, and proofread the e-mail before sending it out. Never use shorthand or acronyms people don't understand. Do not WRITE IN ALL CAPS; it gives the impression you're YELLING. While you may find a joke funny or find an e-mail interesting or disturbing most people don't enjoy getting forwarded e-mails. Never forward e-mails to all your friends' and family. Realize that e-mail is not encrypted and can be forwarded to other people. Never send personal or company confidential data in e-mail. Use the "Reply to all" option cautiously. Really make sure if there are multiple recipients in the CC that everyone really needs to see your reply. Do not over use e-mail program options such as "high-priority," "automatic replies," "read receipts," etc. Also, use BCC instead of CC when it's not important for the e-mail recipients to see whom the e-mail was sent to and to help keep everyone's e-mail addresses private.